Crockpot Dessert, Oh Yes I Did! OK, this picture may not do justice to the yumminest that it was! And, you all know by now that I do not bake. But, my wonderful daughters came over for dinner tonight and I thought I would actually try to make them a dessert. This is a crockpot recipe. It is called Blueberry Dump Cake. My girl’s said it was delicious, and they wouldn’t lie to their Momma! I got it from The New Homemakers website. I love this because you can put it in the crockpot 3 hours before dinner , and it is ready just in time for dessert. I put it in bowls then topped it with vanilla ice cream. 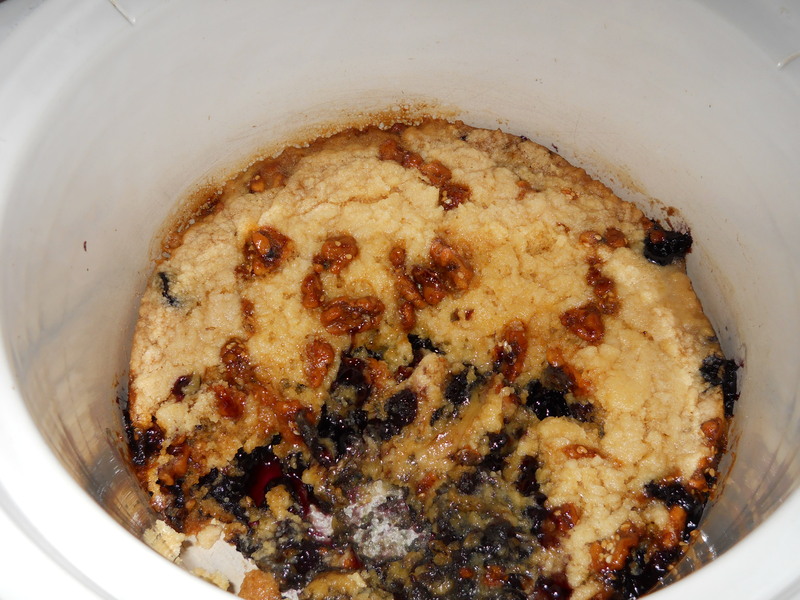 Recipe: 1 can blueberry pie filling, (my girls thought apple or cherry would also work) ,1 pkg yellow cake mix, 1/2c melted butter & 1/2 c chopped walnuts. Place pie filling in bottom of crockpot. Combine cake mix and melted butter in a bowl , sprinkle cake mixture on top of filling. Top with chopped walnuts. 2-3 hours on low . Depending on how hot your crockpot is. Serve in bowls, topped with vanilla ice cream. This is a perfect fall dessert. Hope you try it and enjoy it as much as we did! Night all! This entry was posted in General on October 4, 2011 by andrewsbeth. You know how I love easy fall comfort food this time of year. I’m sure it was great. Yes, this was really good, but a cheap , knock off version of Tom’s real fruit in the ramikins crumble!